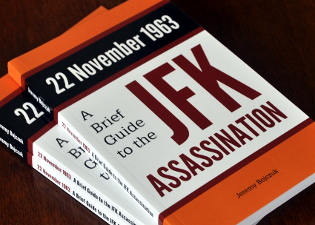 You are here: Home › Further Reading › JFK Assassination FAQs › Did Lee Harvey Oswald Leave Any Fingerprints? Lee Oswald left prints on the rifle that was found on the sixth floor of the Texas School Book Depository, and on two cardboard boxes close to where three bullet shells were found. and that he had handled the rifle that was discovered on the sixth floor. The Dallas police and the FBI discovered Oswald’s prints on some of the cartons and on the rifle, but the evidence turned out not to shed any light on the question of whether or not he was guilty of the assassination. The four cartons closest to the south–eastern window were examined for prints. According to the Warren Report , they contained “20 identifiable fingerprints and 8 palmprints”, as well as a number of indistinct and fragmentary prints, at least some of which were no doubt from other TSBD employees. One of these cartons “contained a palmprint and a fingerprint which were identified … as being the left palmprint and right index fingerprint of Lee Harvey Oswald”. Another carton contained Oswald’s right palmprint. For the official account and photographs showing the location of the cartons, see Warren Report , pp.138–141. How Old Were the Prints? Oswald’s right palmprint had been detected by the use of fingerprint powder, which indicates that it had been placed on the carton within three days of the assassination. The other prints were only able to be detected by chemical analysis, which suggests that they were probably older than the right palmprint (ibid., p.141). Several prints were those of police officers and FBI examiners (ibid., p.249). One palmprint remained unidentified, and presumably belonged to an employee or assassin who was not Oswald (see Warren Commission Hearings , vol.26, pp.799ff [Commission Exhibit 3131], which notes that fingerprints were taken from every TSBD employee who had legitimate access to the sixth floor). None of the other cartons in the piles by the window appear to have been tested for prints. How Incriminating are the Prints? The evidence of Oswald’s prints on two of the cartons is consistent with the hypothesis that he had handled those cartons during the assassination. It is consistent also with the known fact that his job involved, among other things, handling cartons of books on the sixth floor of the Texas School Book Depository. Also in Oswald’s favour was the fact that the four cartons, which would almost certainly have been handled by a sixth–floor assassin just an hour or so before being tested for fingerprints, contained only three of his prints, of which just one is likely to have been deposited within three days of the assassination. No witnesses reported seeing Oswald wearing gloves that day. No fingerprints were found on any of the three empty bullet shells found in the TSBD, or on the intact bullet. Nor were any prints found on the rifle clip that held the intact bullet and into which the shells must have been loaded by hand ( Warren Commission Hearings , vol.4, pp.253, 258–60). Lieutenant J.C. Day of the Dallas police examined the rifle, and found faint traces of two fingerprints on the metal housing by the trigger. He took photographs and applied a protective layer of cellophane to the area ( Warren Report , pp.122f). Shortly before midnight on the day of the assassination, the rife was flown to Washington. Sebastian Latona, a fingerprint expert at the FBI laboratory, examined the rifle and the photographs, but concluded that no identifiable prints were present ( Warren Commission Hearings , vol.4, p.21). The rifle was returned by the FBI to the Dallas police on 24 November. The absence of identifiable fingerprints does not imply that Oswald had not handled the gun. He may have wiped it clean, or, as Latona suggested in his testimony, the wooden and metal surfaces may not have retained sufficient moisture from Oswald’s skin to permit fingerprints to survive. On 26 November, the Dallas police sent all the physical evidence in their possession to the FBI in Washington. It arrived the next day. Two days later, on 29 November, an extra item arrived, a palmprint which the FBI identified as having been made by Oswald’s right hand (Commission Exhibit 638–640). The partial palmprint, of the ‘heel’ or ulnar side of the right palm, was apparently found on the underside of the barrel, in an area that was covered by the wooden stock when the rifle was in its assembled state ( Warren Report , p.123; Warren Commission Hearings , vol.4, p.7). Oswald’s handling of the rifle when it was disassembled is consistent with his apparent ownership of the rifle, even if it cannot show that he had handled the rifle when it was assembled. There are, however, reasons to doubt the authenticity of the palmprint. Why was there no Photograph of the Palmprint? At about 8pm on the day of the assassination, Day had made photographs of the fingerprint traces around the trigger, and had covered this area with cellophane. He claimed that he lifted the palmprint using adhesive tape, but did not photograph it (ibid., p.261). It was standard procedure to make a photograph of a fingerprint or palmprint before attempting to lift the print (ibid., p.41). When asked why he had not made a photograph of the palmprint, Day claimed that he had been told by Jesse Curry, the chief of police, “to go no further with the processing”. In an earlier interview with the FBI, however, Day had claimed that he had not received this instruction from Curry until immediately before the rifle was due to be sent to Washington, more than three hours after he had worked on the prints ( Warren Commission Hearings , vol.26, pp.832f [Commission Exhibit 3145, p.7]). Did Traces of the Palmprint Remain on the Gun? Day claimed that after he had lifted the palmprint, “there were traces of ridges still on the gun barrel” ( Warren Commission Hearings , vol.4, p.262). Latona, however, testified that he had seen no such traces, and that the absence of photographs and protective cellophane gave him no reason to suspect that any palmprints had existed (ibid., p.24). Latona’s colleague, Paul Stombaugh, testified that he had examined the rifle immediately upon its arrival at the FBI laboratory, and that there was “latent fingerprint powder … all over the gun” (ibid., p.81). If traces of the palmprint had existed, they would almost certainly have been revealed by the fingerprint powder. The existence of a palmprint on the rifle was not announced officially until the evening of Sunday 24 November, two days after Lt Day had examined the rifle, and the day when the rifle was returned to the Dallas police by the FBI. In several press conferences over the previous two days, senior police officers and the District Attorney, Henry Wade, enthusiastically announced a great deal of incriminating evidence against Oswald, much of which turned out to be untrue. Yet no–one in authority mentioned the palmprint, one of the most important pieces of evidence linking the rifle to Oswald. For examples and criticism of the prejudicial announcements by Henry Wade and Jesse Curry, see Mark Lane, Oswald Innocent? A Lawyer’s Brief . For transcripts of the press conferences, see Commission Exhibit 2141 to Commission Exhibit 2173. The prints on two of the book cartons show only that Lee Harvey Oswald had handled the cartons at some point: one of them perhaps on the day of the JFK assassination, the other probably some time earlier. The existence of prints on the cartons does not by itself incriminate Oswald. His job required him to handle cartons of books on the sixth floor of the Texas School Book Depository. The absence of identifiable fingerprints around the trigger on the rifle tells us nothing about who, if anyone, fired the rifle on 22 November. The palm print on the underside of the rifle barrel, if genuine, shows that Oswald had handled the rifle, but does not show that he handled it on the day of the assassination. The inability of the FBI examiners to detect anything other than faint fingerprints on the rifle; the failure of the Dallas police to supply the FBI with contemporaneous photographs of the palmprint; and the lack of any official announcements about an incriminating palmprint, make it not unreasonable to conclude that the palmprint on the rifle, like the paper bag that supposedly had contained the rifle, was manufactured after the event, and that there is consequently no evidence that Oswald had handled the rifle at all. There was a serious question in the minds of the Commission as to whether or not the palm impression that has been obtained from the Dallas Police Department is a legitimate latent palm impression removed from the rifle barrel or whether it was obtained from some other source and that for this reason this matter needs to be resolved. The FBI laboratory attempted to resolve the matter by noting that five irregularities on the underside of the barrel were present on the palm print impression ( Warren Commission Hearings , vol.25, p.897 [Commission Exhibit 2637]; cited by Warren Report , p.123). “I just don’t believe there ever was a print,” said Drain. He noted that there was increasing pressure on the Dallas police to build evidence in the case. Silvia Meagher, Accessories After the Fact: the Warren Commission, the Authorities, and the Report , Vintage, 1992, pp.120–127. Henry Hurt, op. cit. , pp.106–109. Was Lee Harvey Oswald an Expert Marksman? How Reliable is the Neutron Activation Analysis Evidence?